What are the key ingredients to raising successful, self-sufficient offspring? A new life sciences study using 14 years of data on gray wolves in Yellowstone National Park indicates that cooperative group behavior and a mother's weight are crucial. "A female's body weight is key in the survival of her offspring, and cooperation in the protection and feeding of young pups pays off in terms of the production of offspring," said Robert Wayne, a professor of ecology and evolutionary biology at UCLA and co-author of the new research, published this week in the online edition of the Journal of Animal Ecology. Wolves are social carnivores that live in territorial, kin-structured packs. Female wolves depend on other adults in the pack to help them provide food for their pups and defend the youngsters from predators — mainly, competing packs of wolves. 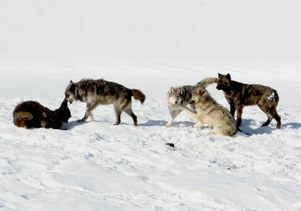 The greater the group cooperation, the researchers say, the better the pack's survival advantage. "Consequently, larger packs tend to get larger and win the 'arms race' of holding territories against the aggressive actions of other packs," Wayne said. "Large packs get better at building armies of soldiers to defend their turf, and cooperative behavior and sociality are maintained by natural selection." 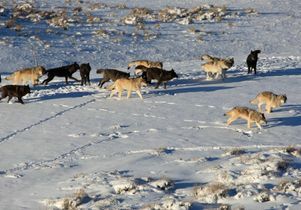 Wolves were re-introduced into Yellowstone Park in the mid-1990s and are rapidly becoming one of the best-studied carnivore populations in the world; they are turning out to be an excellent model for the study of sociality and cooperation, Wayne said. Over many years of intensive collaborative study, former UCLA graduate student Dan Stahler (now a biologist with the National Park Service) and former UCLA postdoctoral scholar Bridgett vonHoldt (who worked in Wayne's laboratory and will soon become an assistant professor at Princeton University) analyzed genetic and life-history data on more than 300 gray wolves. They assessed survivorship and reproductive success, as well as the factors that influenced them, including body weight and pack size, among other variables. They found a striking association between pack size, body weight and offspring survival. "We discovered that mother wolves' body weight and pack size play a crucial role in enabling pups to survive and thrive from birth to young adulthood," said Utah State University assistant professor of wildlife resources Dan MacNulty, a co-author of the study. The research was funded by the National Science Foundation, the National Park Service and the Yellowstone Park Foundation, as well as private donors. Environmental conditions that impact wolf reproduction, the researchers say, include resource availability, population density and disease prevalence — especially deadly canine distemper, caused by a contagious virus to which pups are especially vulnerable. 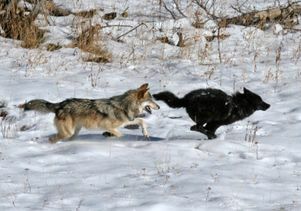 In addition to body weight and pack size, the researchers examined the effects of maternal age and color (gray or black coat) and wolf population size on reproductive success. "Each of these factors affects reproduction, but, overwhelmingly, female body weight and pack size are the main drivers of litter size and pup survival," said Stahler, the study's lead author. "Bigger females produce bigger litters; bigger packs are better equipped to hunt and defend pups and resources from competitors." An accompanying video summarizes the research: http://bit.ly/QSAXv4. UCLA is California’s largest university, with an enrollment of more than 40,000 undergraduate and graduate students. The UCLA College of Letters and Science and the university’s 11 professional schools feature renowned faculty and offer 337 degree programs and majors. UCLA is a national and international leader in the breadth and quality of its academic, research, health care, cultural, continuing education and athletic programs. Six alumni and five faculty have been awarded the Nobel Prize.